I love where I live. Both the view and the history. Given any financial means, I wouldn’t move an inch. Not with a backyard like this. And to top off all that topography, historically, it’s a field day below the horizon out here and there’s endless ground to cover. I even love it when it rains. 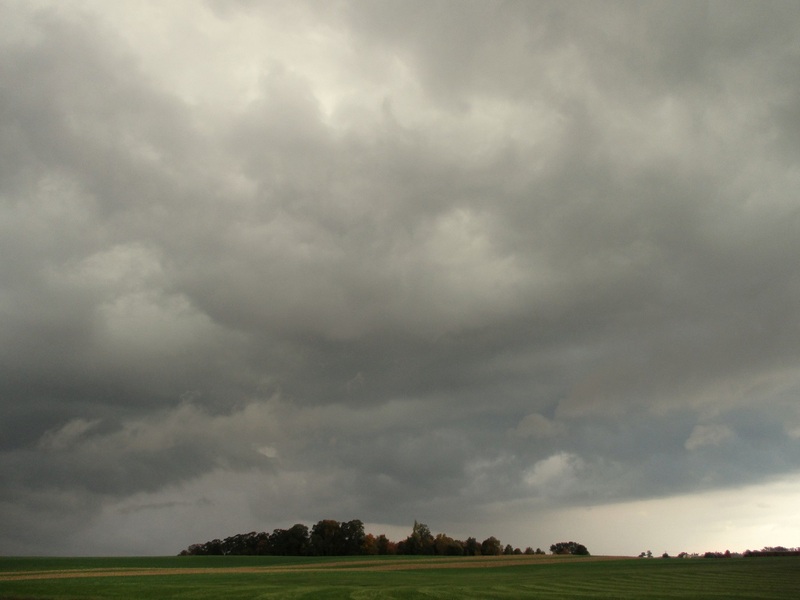 It wasn’t rain, but the blasting winds of early March that found me on the far side of the field. Late in the day while I was still at it, a cold wind picked up hard. I sought shelter in the trees, which sloped down a hill, blocking the wind. It was a beautiful, peaceful spot. A cold clear field runoff stream ran through. 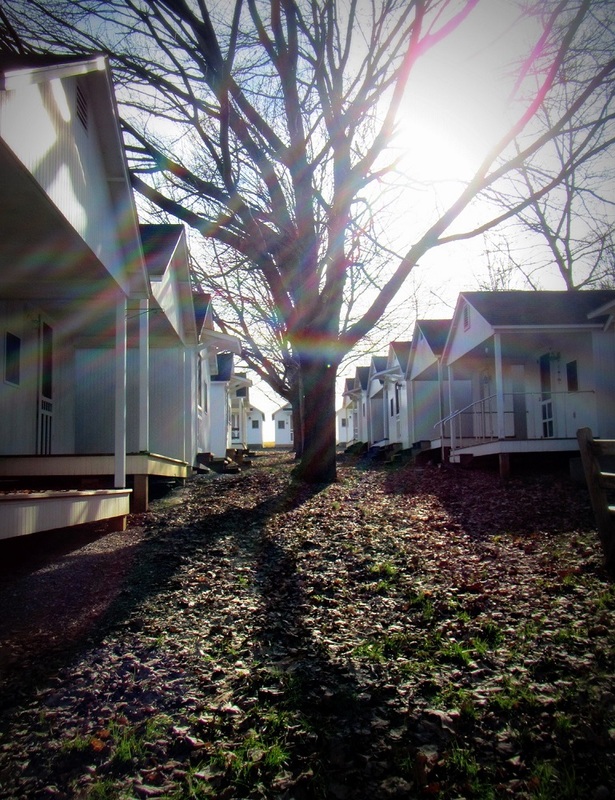 I walked in the sunlight and listened. 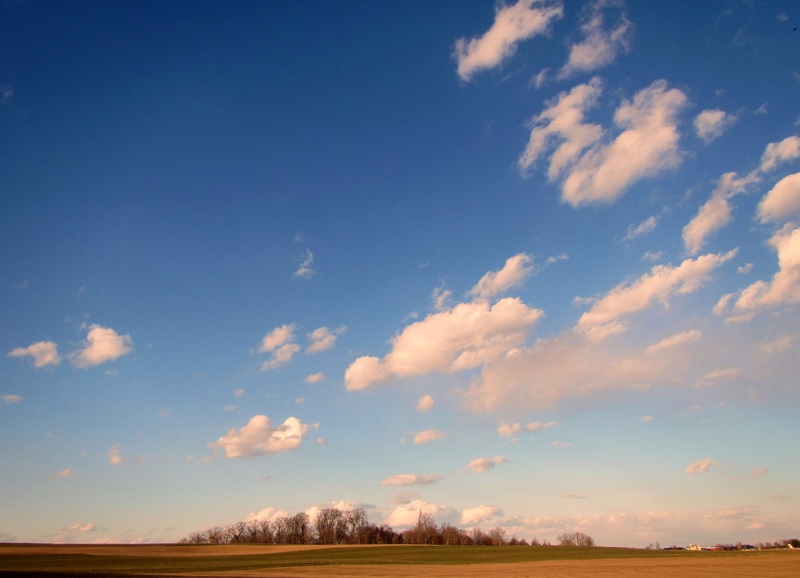 Nothing says you’re alone like the sound of the wind. Until that 89 signal and pitch. And that’s a nice interruption. I wasn’t alone after all. Pretty gal that Lady Liberty, especially in silver with wings in her hair. 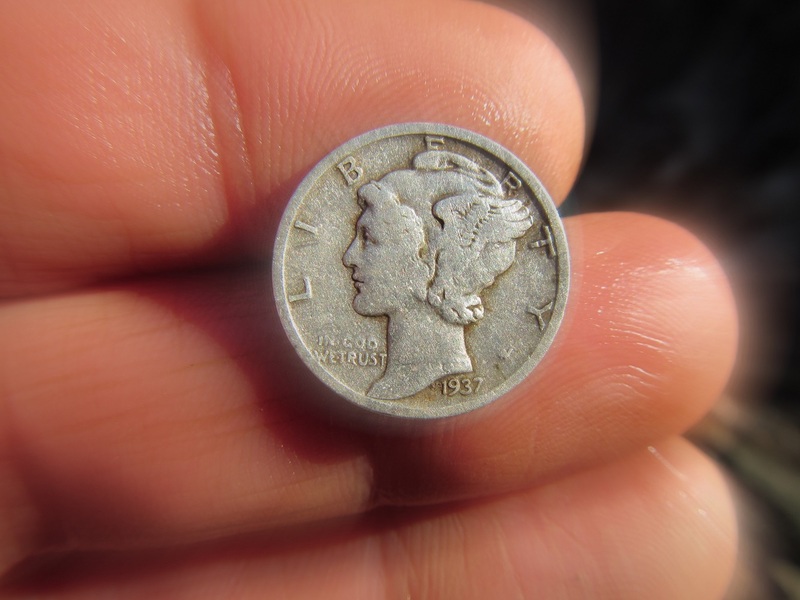 My first Mercury dime, this one from 1937. The runoff stream was handy, as a lady always enjoys a good bath. I sat by the stream and took in the sun. I thought about nothing and everything. I thought about my father, who passed last September. You don’t lose someone once, but everyday. He was born in 1944. After a while I got up and turned only two feet behind where I was sitting, and again, another 89 signal. 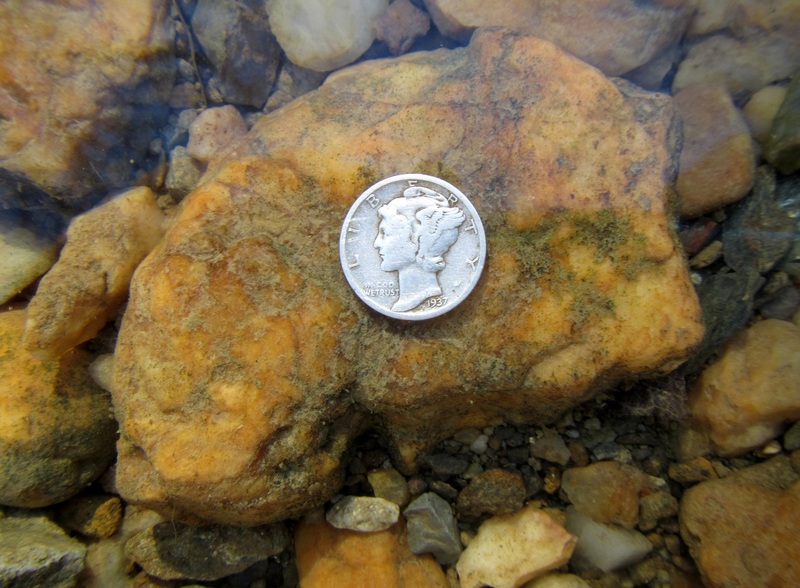 Would you believe me if I told you it was another Mercury dime? And the date? And I had been taking my break literally right on top of it. 1944. The wind didn’t sound so lonely now and the sun felt a bit warmer. For as far as this next dime was from my house, I could’ve thrown a stone. I chanced upon it coming back in from a scout for signals in the field for an old house no longer there. Again, that 89 signal. A random drop, as there was nothing else near it. This was a good ways down and in such crisp condition, I’m sure it was dropped in 1913. 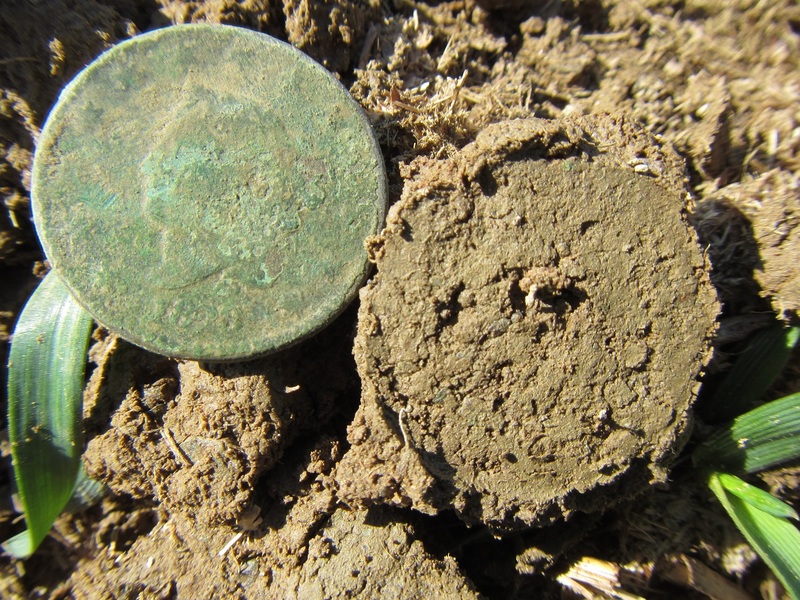 Farmfields are hard on artifacts and coins due to the fertilizer. 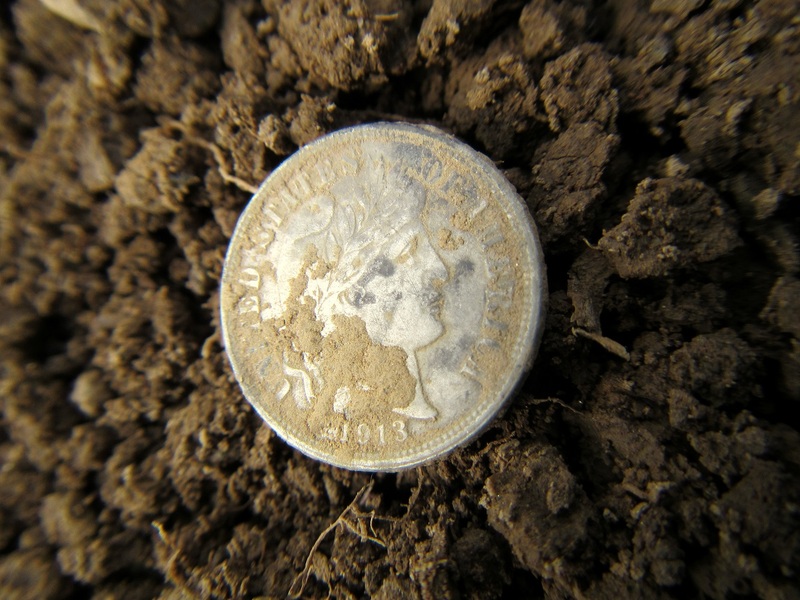 Silver holds up very well, despite being buried for 102 years. It didn’t take much to clean up this little gem. Almost there; I want to see it looking like the day it was dropped. 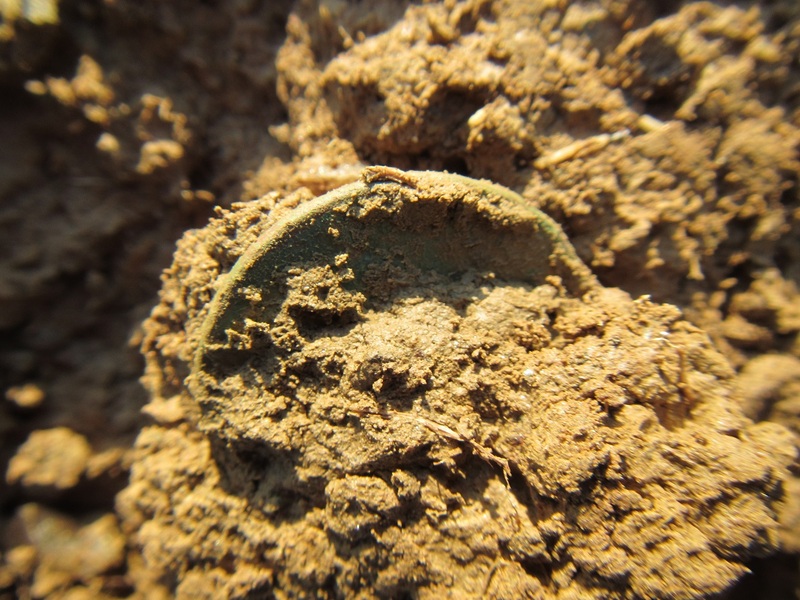 It’s not so much finding coins themselves; it’s finding something with a date on it. 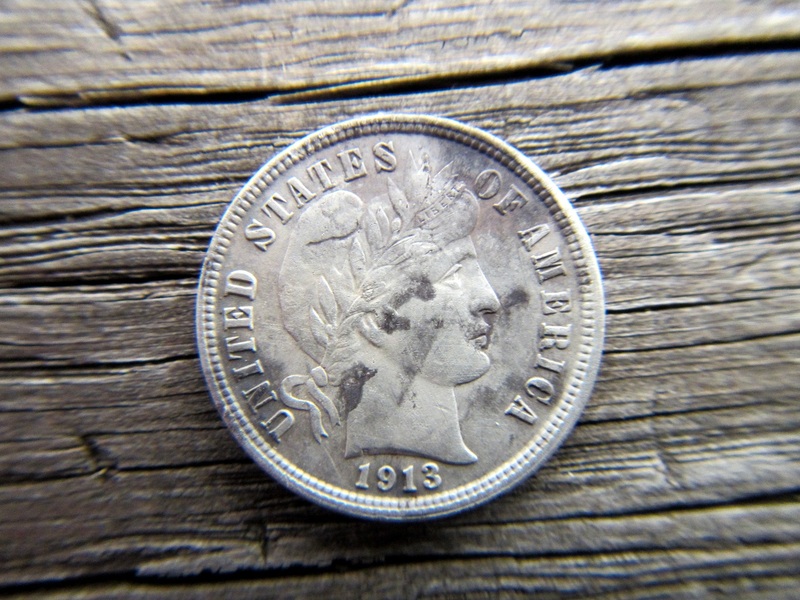 Someone stood where I found this 102 years ago, likely pulled something out of their pocket and this fell out unnoticed. It made no sound landing on soft earth. 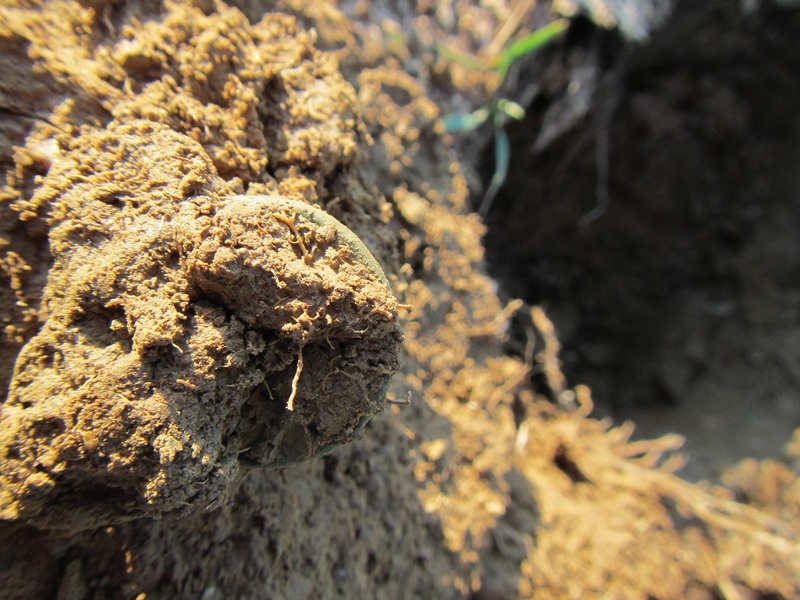 It settled in and was driven deeper by rain and farming activity. Had I not come across that spot, it would still be there another 102 years or forever. I love causing coinus interruptus. Now we’re there. The detail is fantastic. 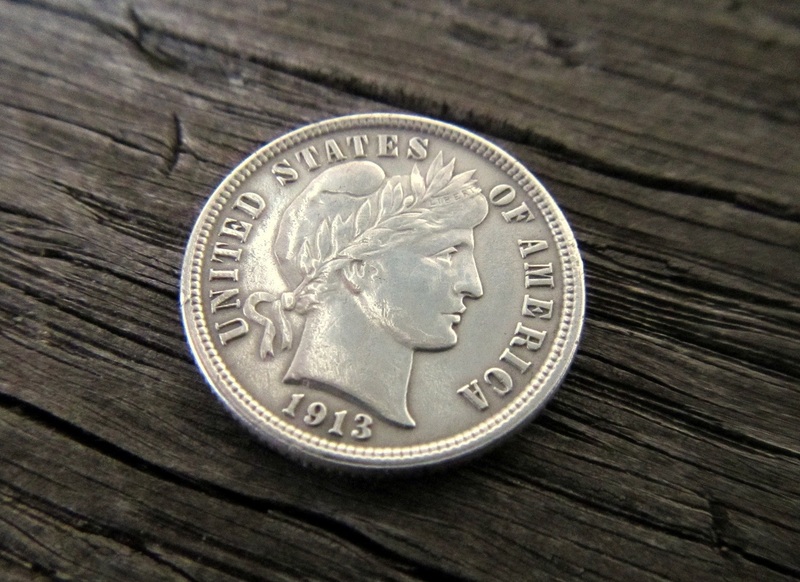 To me, the Liberty on the Barber issue coins looks male. It looks fairly butch, especially compared to the ladies. 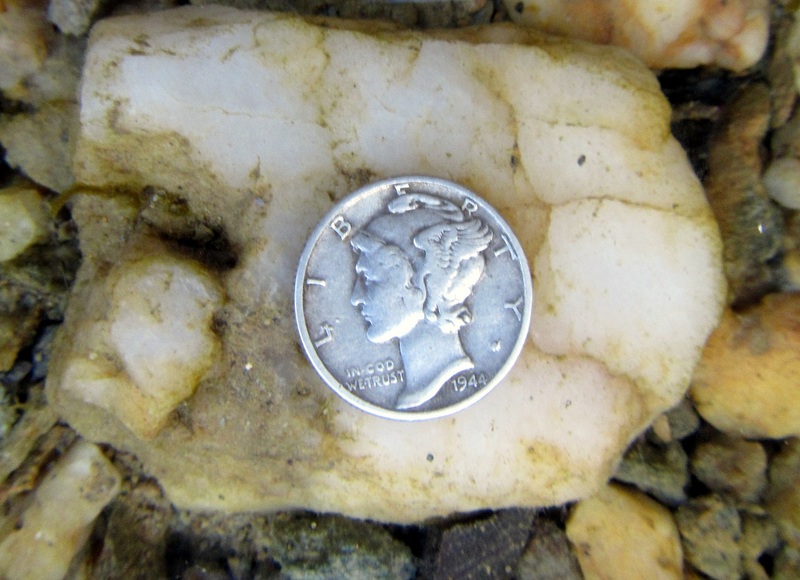 I love finding silver coins. Even though these aren’t worth much and antique stores are full of ’em for a few dollars each, nothing beats finding them yourself. Any you can never even begin to guess what you’ll find next, as I found out. This was such an incredible experience. Like a childhood memory in the golden sun that I got to have again. When I came across this area and realized what it was, I still couldn’t believe it. 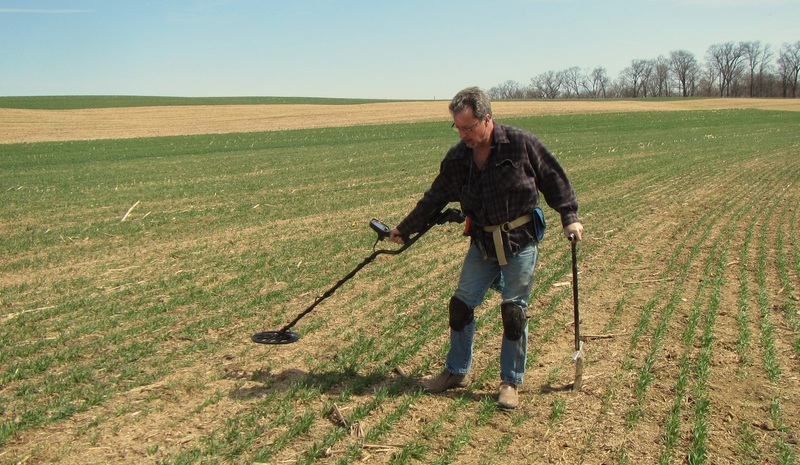 I’d studied old local maps for endless hours all winter and read how my area was first surveyed in 1718 by William Penn’s son, but none of that really hit home until I found evidence firsthand. It started with a 1700’s flatbutton. 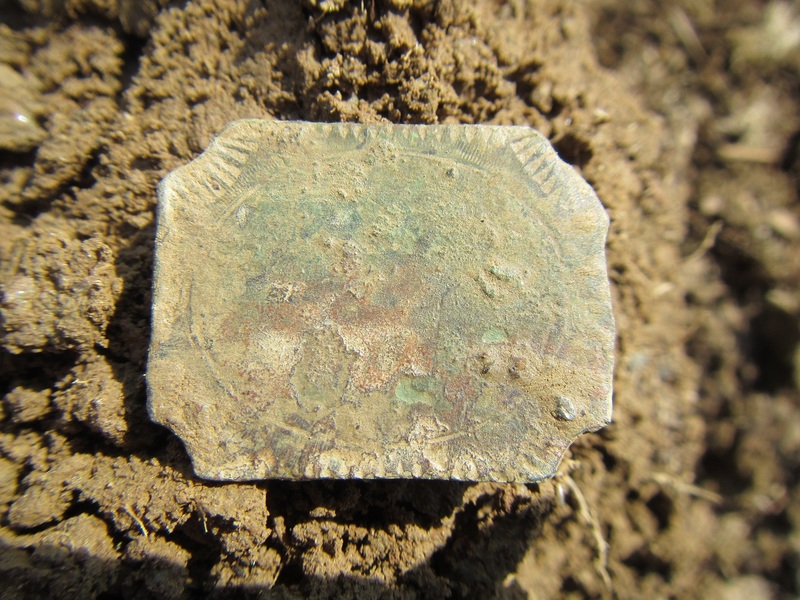 There were a few of these in varying sizes, some with gold and silver still on them. 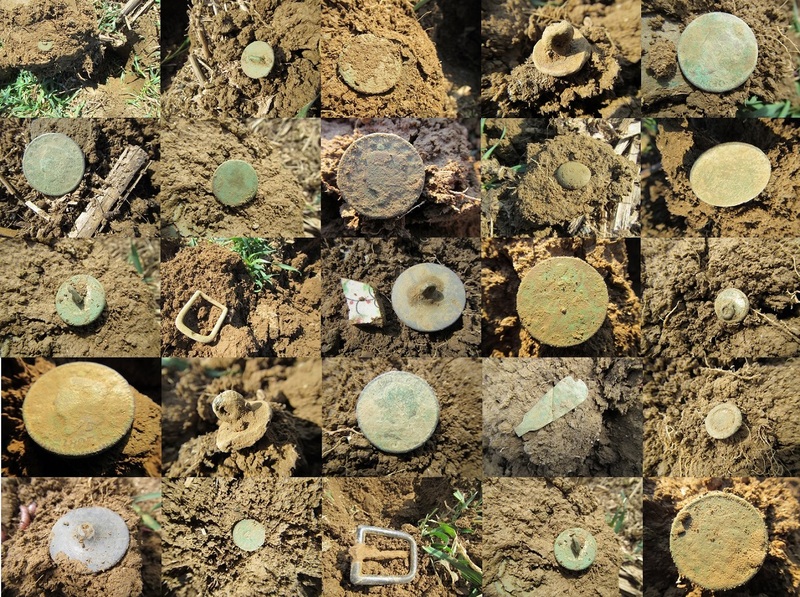 I found a total of 13 colonial era buttons. And that wasn’t all. 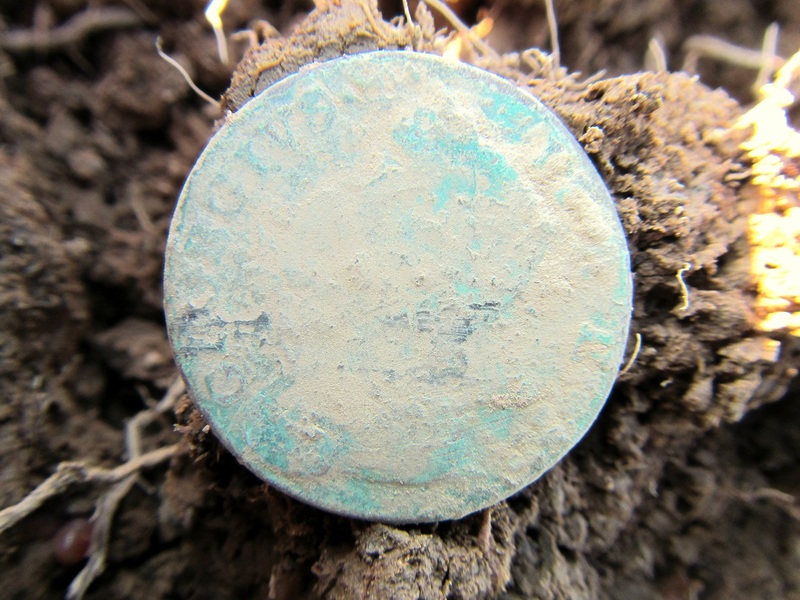 This 1819 Matron large cent got my attention. I had never found a large cent before. 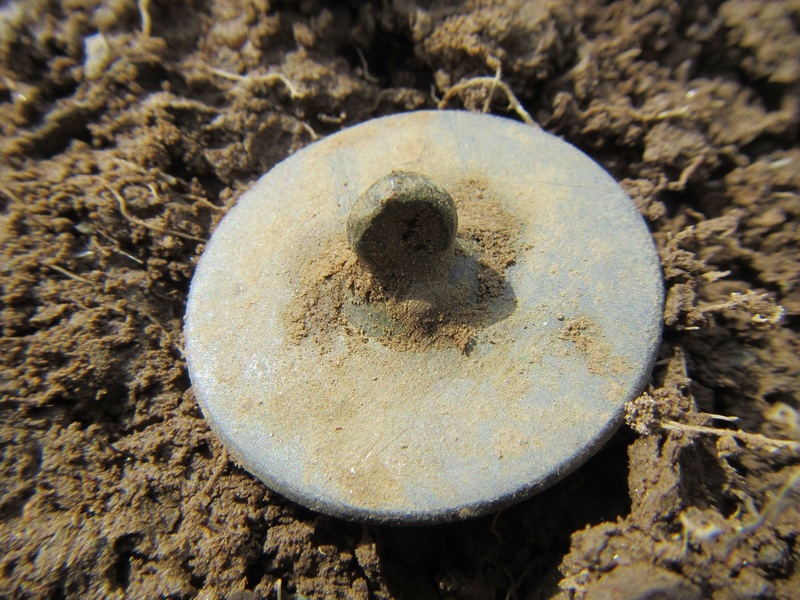 This is a large tombac, a pewter button used for both civilian and military in the 1700’s. The condition is fantastic, these were made with a mix of copper in the pewter to make them hard and durable. This is about the size of a half dollar. I would find two of these. 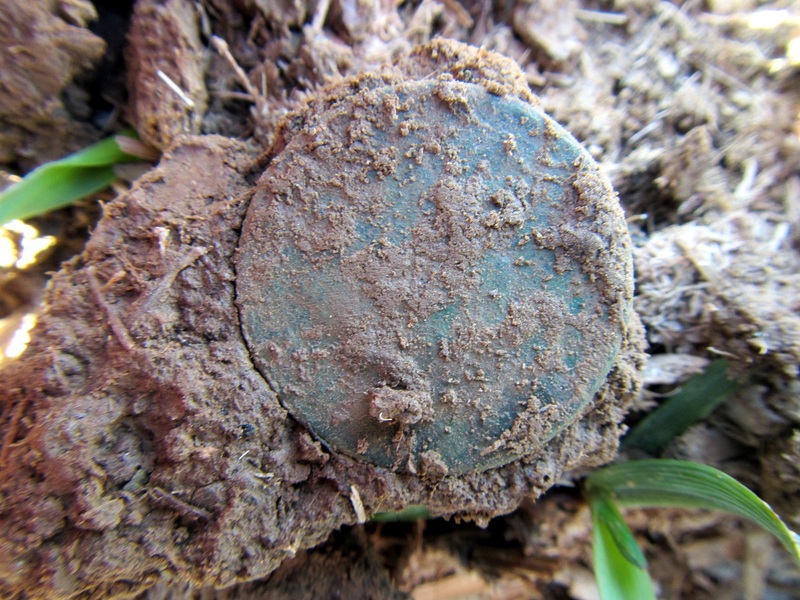 This one came with a floral 1700’s stoneware fragment. 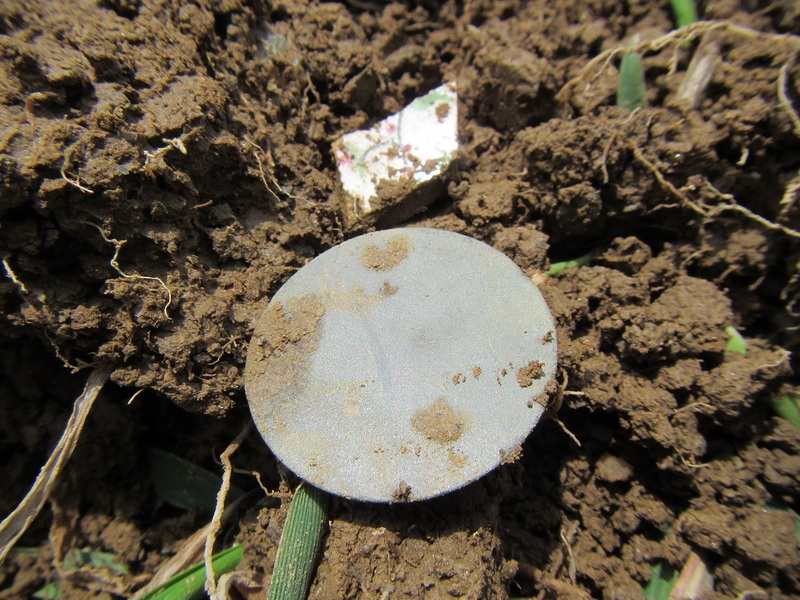 It was find after find in a very localized area of the field. I didn’t know what to expect next. Pretty sure this isn’t a button, but another coin. 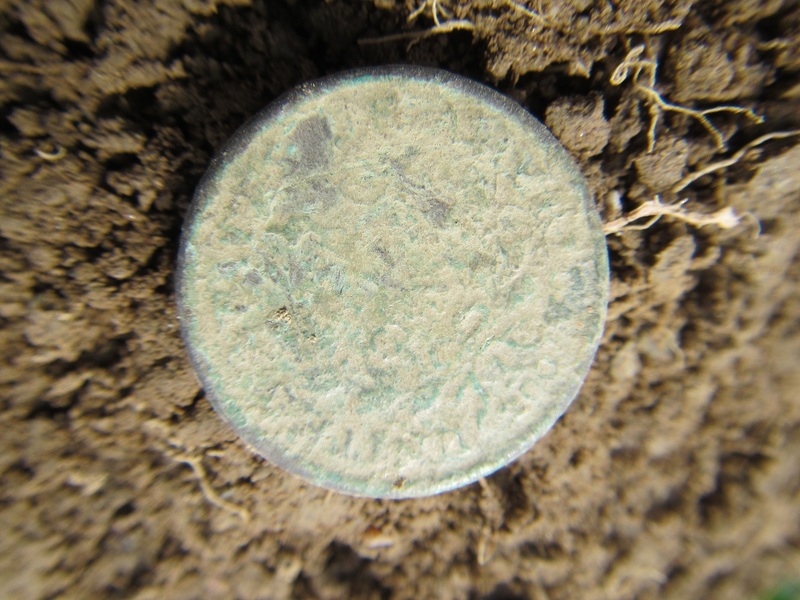 Another Matron large cent, this one was dated 1828. I had no idea, nor was I expecting to find something this old. When I saw the date I couldn’t believe it. This was only 500 yards from my house. 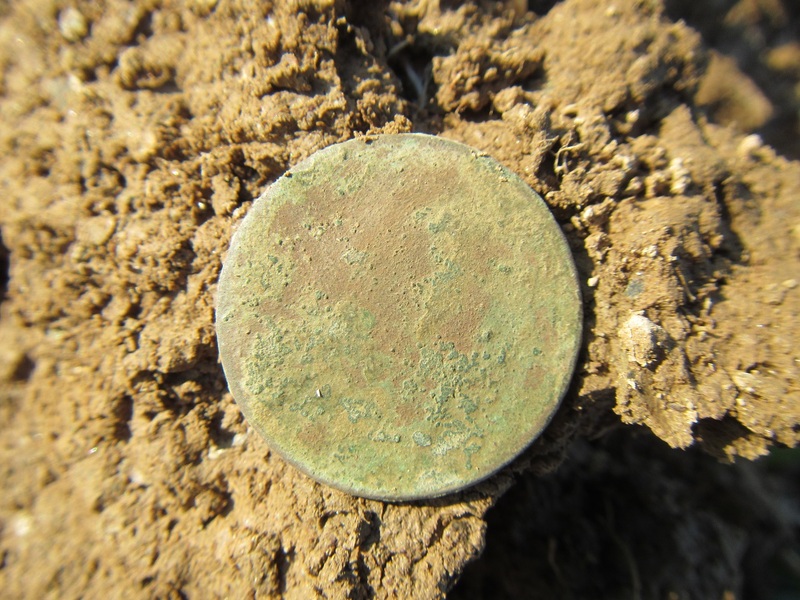 This was the size of a large cent, but I could tell right off it was different. 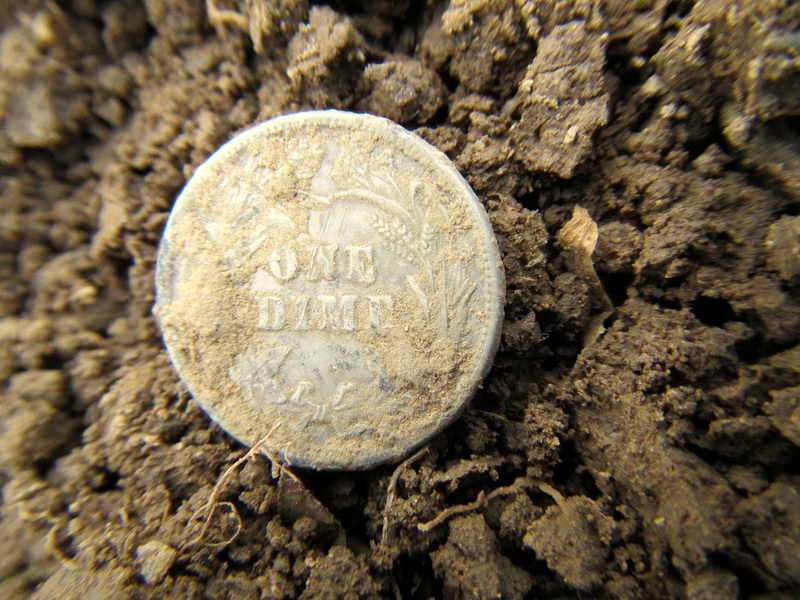 Looking at it closer I saw it was a King George II Half Pence. 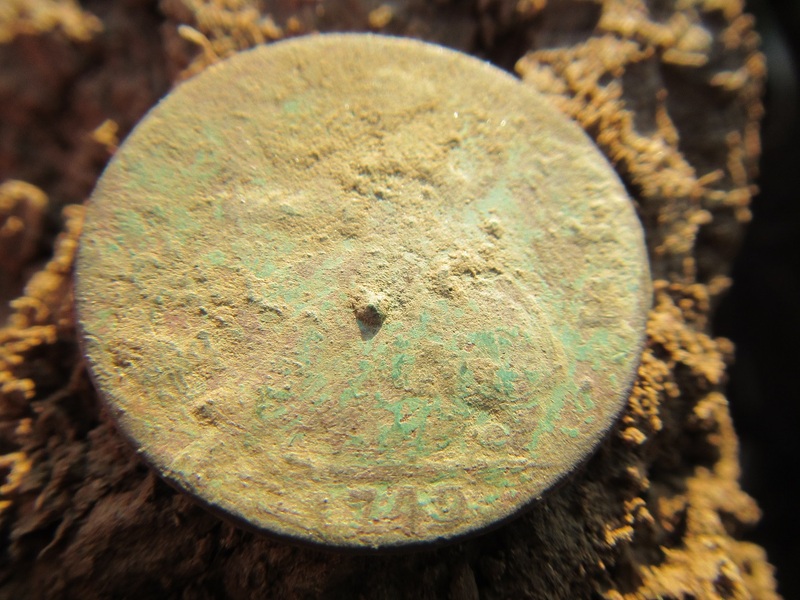 The date was early, much older than the American large cents I had discovered thus far. Wow. This is 280 years old. The front has a bust of King George facing left and reads: GEORGIVS II REX. Recovering from that excitement took a few minutes; it’s finds like these that cause me to take a break and savor the moment. Who knew what I was to find next? This coin was smaller and I could see it was American. 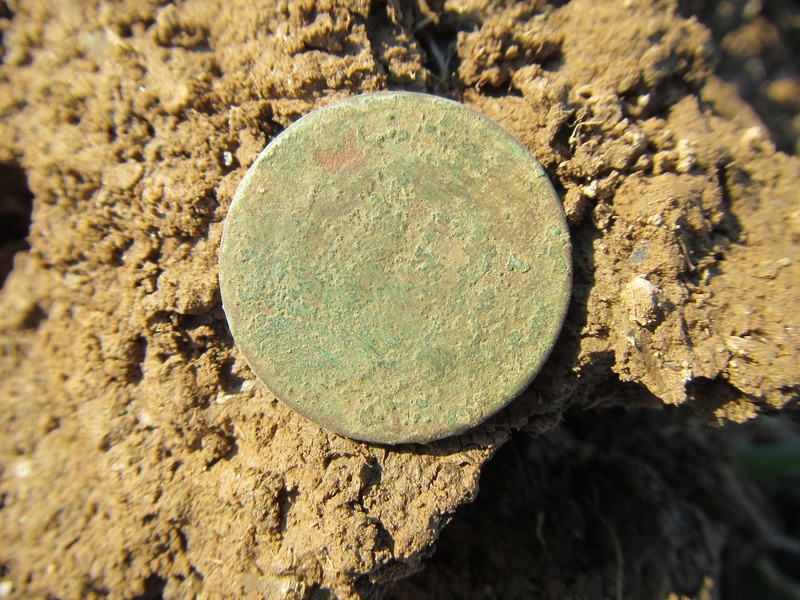 But what kind of coin is this, and how old? 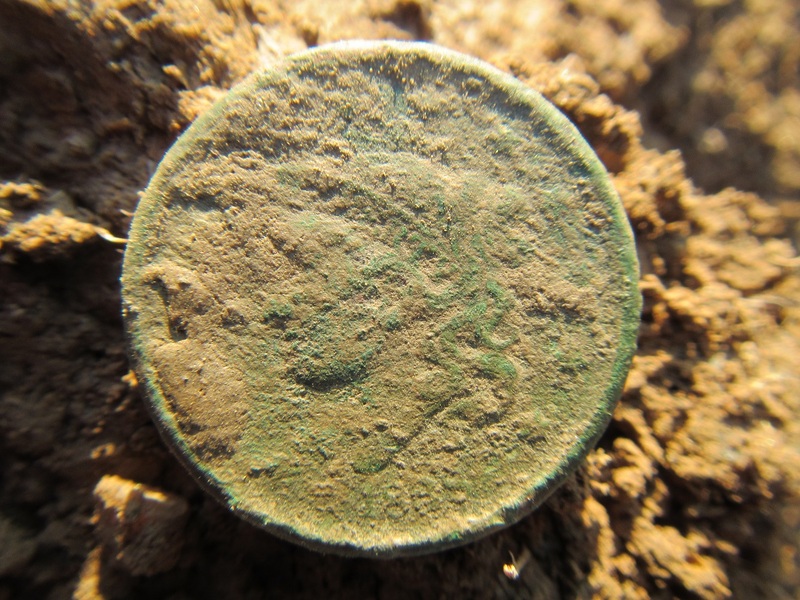 This turned out to be a Draped Bust 1803 Half Cent. My first one. This was quite a day and not one I’ll see the like of again anytime soon. And the sun was still shining, especially on me. 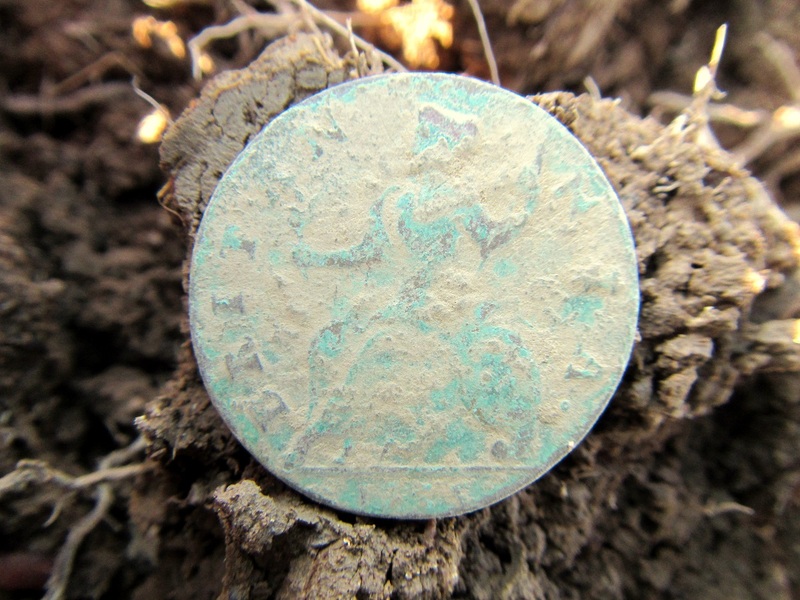 This artifact is very interesting and no doubt very early, it’s brass, all hand worked, the engraving is detailed like designs on a dollar bill. 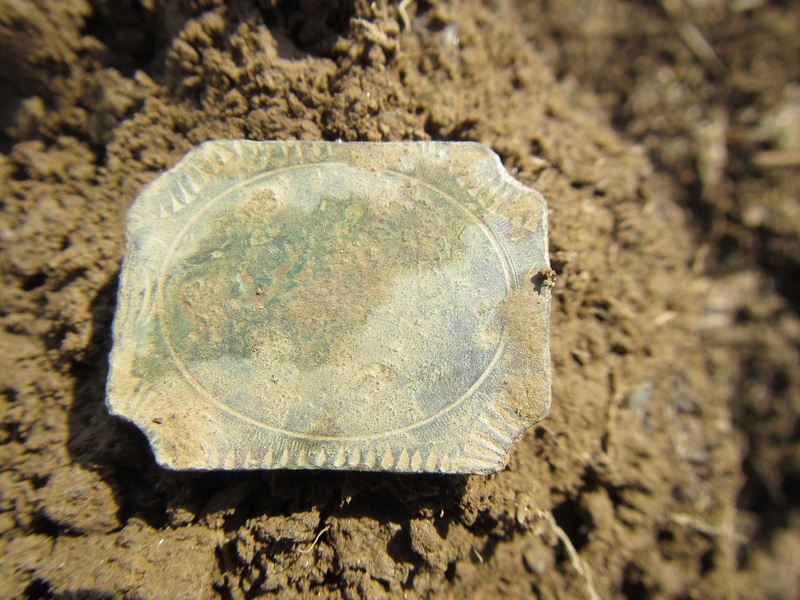 The center has an oval and there are remains of gold gilt still on it. It’s 1-1/2″ by 1″ and I’m still not sure, but I think it may be a pocket portrait of some sort, at least until the better explanation comes along. Both sides are alike. Very likely I’ll be updating this as someone will know what it is. So what did I find next? I didn’t know at the time, but found out later. Field toast. 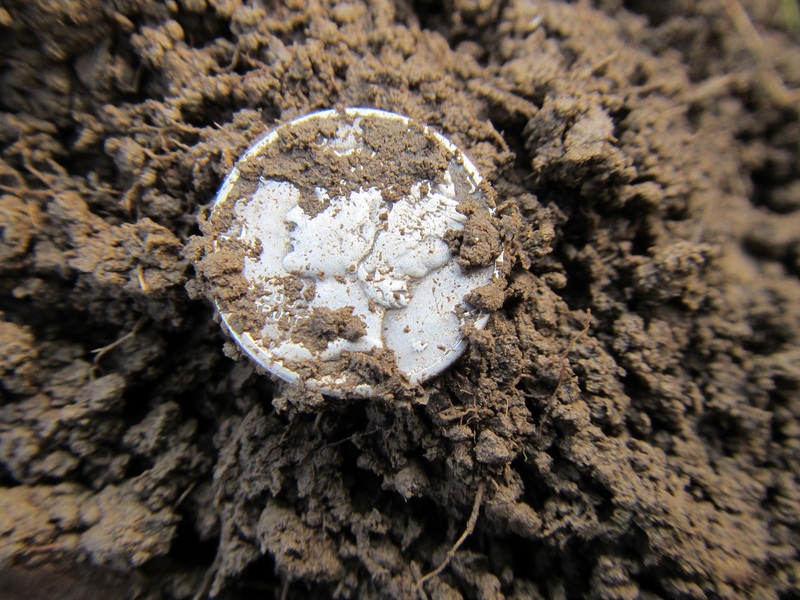 This refers to a copper coin so toasted by fertilizer that you don’t know what it is. That side wasn’t much of a help either. Not knowing what it was, and with nothing to lose, I gave this copper toastie a soak in hydrogen peroxide for 4 days. This cleans copper without harming it. In this case it actually made it recognizable. My field toastie after the soak. 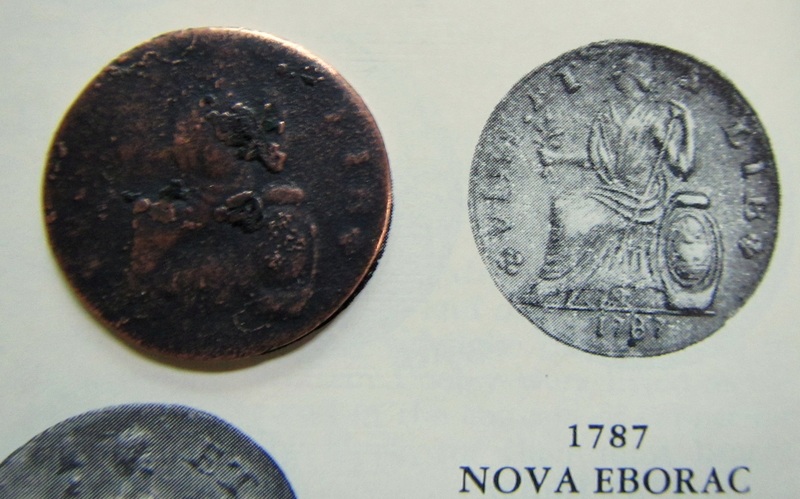 It’s a New York state half pence made in 1787. The words NOVA EBORAC are latin for New York. On the back reads VIRT ET LIB, meaning virtue and liberty. I did some further cleaning, (yes, you can sometimes polish a turd) and it looks like a coin again. I used only dish soap and a mild scrubbie, no more chemicals, and took it down to the copper. I set in on the page in Yeoman’s to show comparison. I like it much better now. The bust side was obviously facing down and was more protected, as the back is very worn after (only) 229 years. Now, where were we? Ah, yes, out here in the field. And what do we have here seeing the sun for the first time in a very long time. 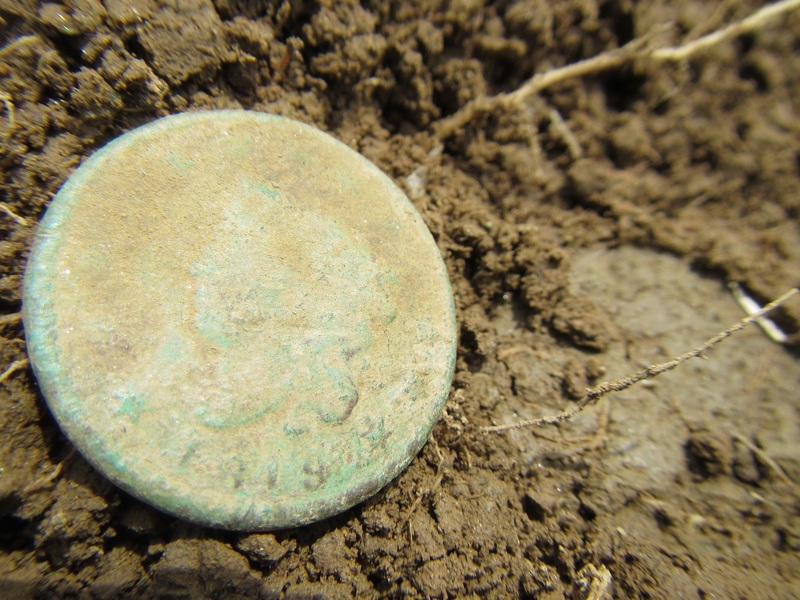 Another King George II and this one from 1749. Unbelievable. 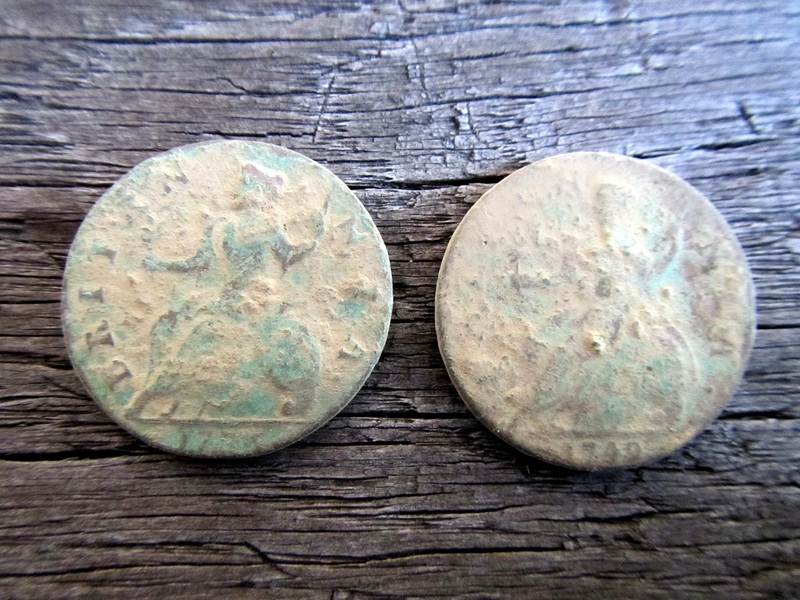 I had found more American large cents, seven Matrons total, dating from 1819 to 1838, most were toast, but the 1838 is recognizable. 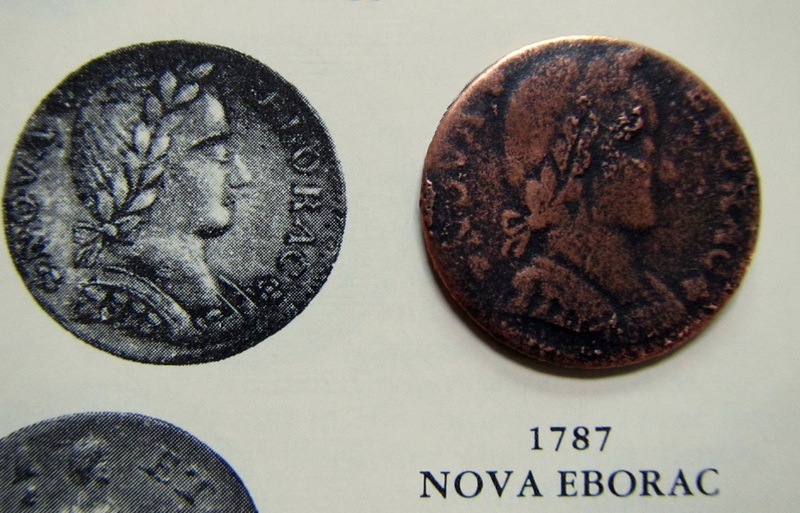 1838 was the last year for the Matron style large cent. 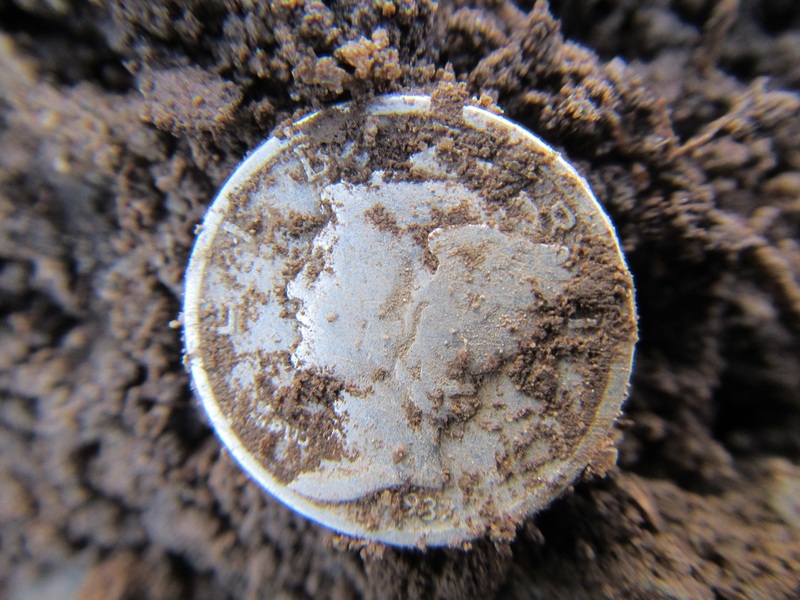 It was very deep on the bottom of a plug, all items were about this depth, seven to eight inches down. 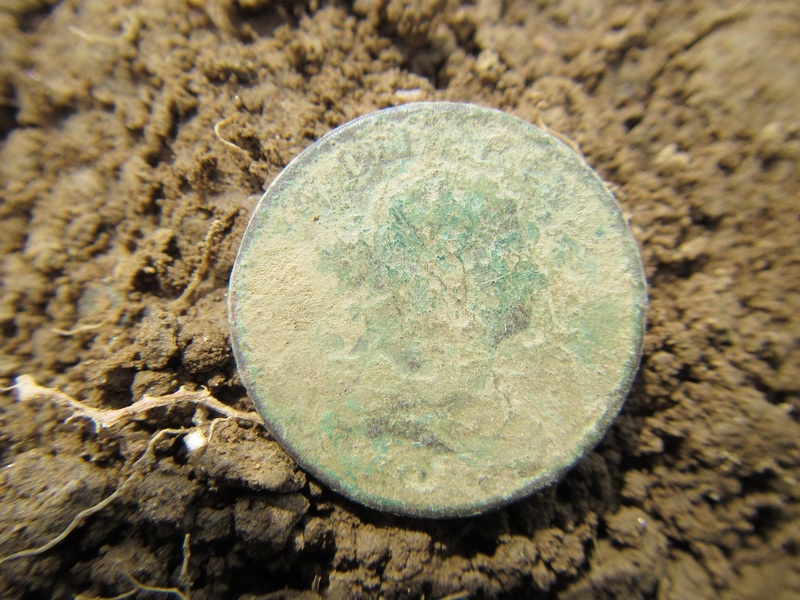 If I had found only this 1838 Matron large cent I would have been thrilled. 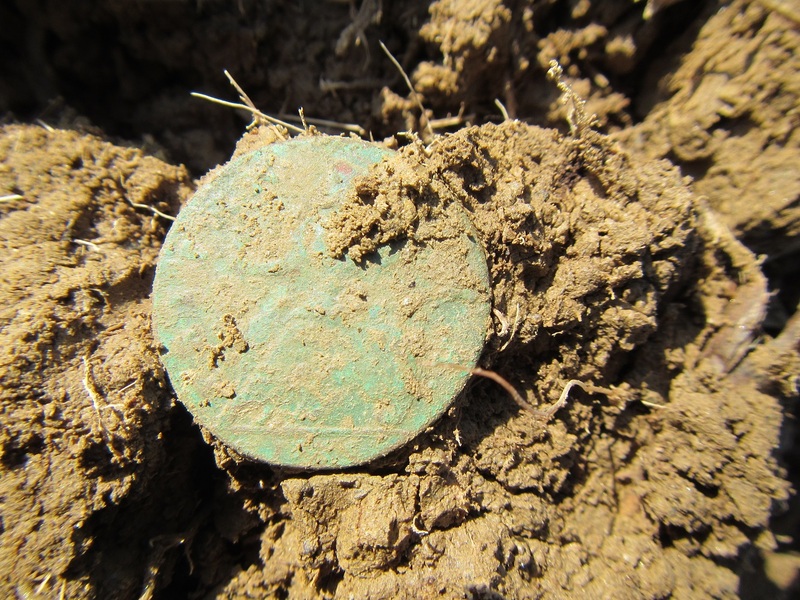 But, to find this amongst some thirty artifacts, including buttons and coins, this being the newest of the lot was quite a field day. These items were all found in and around what was once a work area. Possibly a barn or stable. They were not lost or dropped all at once, but over a long period of time. 1735-1838. 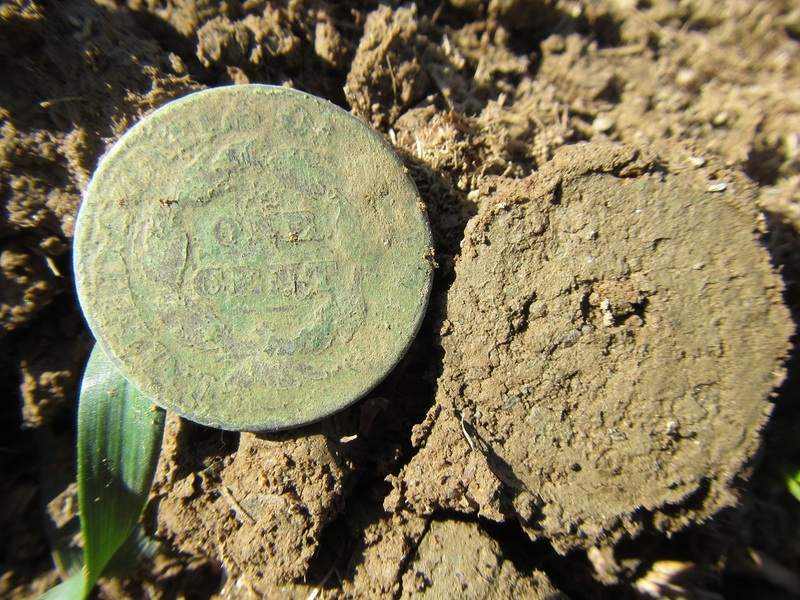 I doubt I’ll find another such site and coins with a date spread of 103 years. But never say never. I research. I tend to be a tad lucky, and go at it until I’m exhausted. It’s only hard work if you’re doing it right. Of course these two are my favorites. 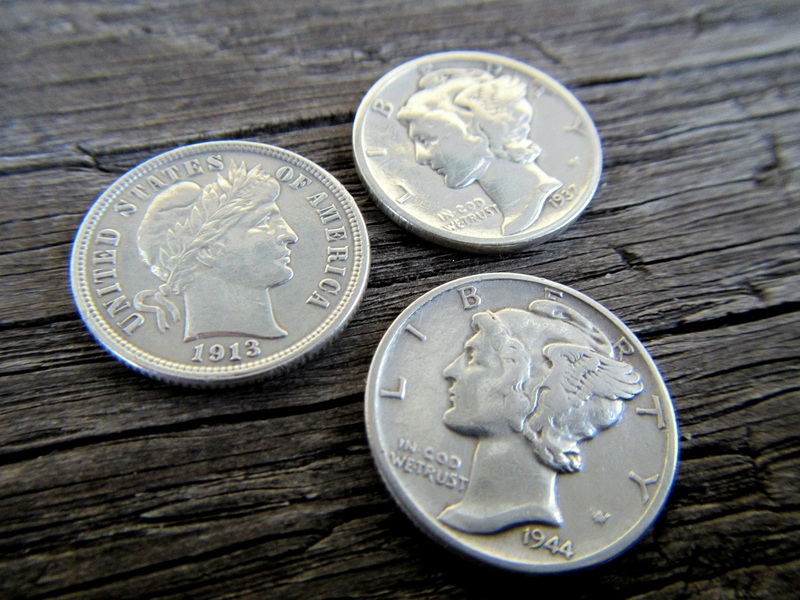 A few half pennies, a few dimes.